We have seen much in the recent weeks about the crisis at the border between the U.S. and Mexico. Families have been split apart and people are having to wait long periods of time to be seen. We have the opportunity to partner with Myers Park UMC and Catholic Charities to make toiletry kits for men, women, and children. These kits will be taken to the border by a mission team from Myers Park on August 14, 2018. The kits can be brought to church on July 29, August 5, and August 12 and they will then be taken to Myers Park. The deadline is Aug. 12th. Please pack exactly what is listed otherwise they have to unpack and it will waste precious volunteer hours. Pack items in a gallon-sized Ziploc bag. Once items are packed, either trace your hand with marker or paint your hands and make handprint(s) on the bag as you pray over them. This will show that the recipients and the items have been prayed for and that we hold them in our hearts and hands. Want to pack individual kits? Please remember to follow these lists exactly: Men’s Kit: Toothbrush, toothpaste, comb, razor, shaving cream, deodorant, chap-stick, hand sanitizer, sunscreen, shampoo, note of encouragement in Spanish. 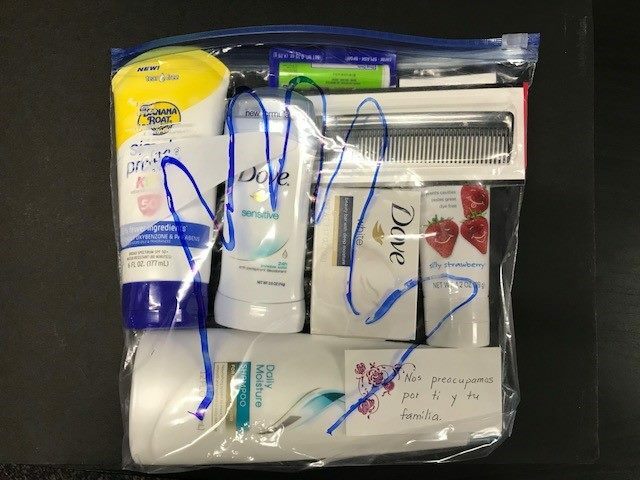 Women’s Kit: toothbrush, toothpaste, brush (small), tampons or pads, deodorant, chap-stick, lotion, sunscreen, soap, shampoo, note of encouragement in Spanish. Children’s Kit: toothbrush, toothpaste, comb, sunscreen, chap-stick, soap, shampoo, deodorant, note of encouragement in Spanish.